Radical Skincare Firming Neck Gel Review: Is It Really Good? Radical Skincare is a brand inspired by the keen practice of Dr. Richard Edlich, a top plastic surgeon, and the boldness of his daughters, Liz and Rachel, to offer beauty products that promise nothing less than radical benefits. Kelp Extract: Improves skin synthesis and helps improve overall skin moisture by re-fortifying the outer layer, making your neck skin better able to resist the damaging effects of environmental factors. Green Tea and Resveratrol: Enriched with high amounts of antioxidants that brings your skin health to an entirely different level as it helps pick up your tired skin and protect it from further damage caused by free radicals. Aqua Cacteen: Derived from a cactus plant, this ingredient helps improve your skin’s resilience from damage and correct saggy skin. Blowhite: Derived from grapefruit extract, this ingredient adds more antioxidant power to this product’s formulation, as it also inhibits melanin production that helps lighten your skin. Sepilift: Derived from botanical sources, this complex significantly improves the moisture content of your skin, correcting sagginess and the appearance of wrinkles with continued product use. Retinol: Works to speed up skin cell turnover and regeneration by sloughing off the top layer of your skin, eventually revealing a less damaged skin with a brighter complexion and a younger appearance. Use Radical Skincare Firming Neck Gel twice daily, after cleansing and toning, for best results. This product is recommended to be layered with Radical Skincare Peptide Infused Antioxidant Serum. Radical brand products are never tested on animals. Critical Radical firming neck gel reviews, although limited, show that this product may just have the winning formula to transform your aging neck skin. This product is formulated with butylene glycol and retinol, ingredients that are well-known to cause severe skin irritations. The formula is infused with phenoxyethanol, a neurotoxin, as preservative. Radical firming neck gel reviews may not be the best source of information for product effectiveness because of few feedback. 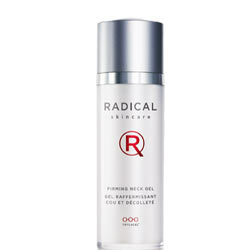 Radical Skincare Firming Neck Gel is a well-thought out formulation that delivers multiple benefits for your skin. However, the product price is too steep and you may have to reconsider how this product fits well into your beauty budget.